New sylph Ocarina is available in House of Cards! Seize the chance to get her to fight with you! 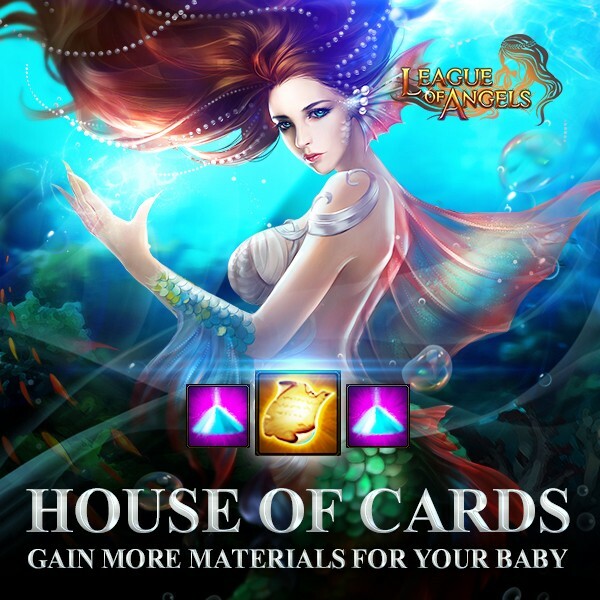 Besides, you also have a chance to get Magic Dust Chest and Parchment Chest to upgrade the skills of your baby! - You can swap the required cards for: new sylph Ocarina, Shadow Spirit, Moonlight Spirit, Nether Lord, Namiria, Exiled Arrow, Bloodsucker, Thunder Lord, Dinvine Hunter, Dark Valyrie, Lunar Priestess, Crescent Elf, Fame Hunter, Dark Paladin, Ghost Paladin, Headless Horserman, Dragon Queen, Dragon Empress, Yasi Delaney, Poseidon, Earthshaker, Valentina, Fallen Angel, Lvl. 7 Cherubstone, Khaos Core, Purgatory Soul, Lvl. 5 Aeolus Glorystone, Lvl. 5 Brooky Glorystone, Lvl. 5 Flaming Glorystone, Lvl. 5 Shadow Glorystone, Lvl.12 HP Gem, Lvl.12 Dodge Gem, Lvl.12 END Gem, Lvl.8 Dodge+Hit Gem, Lvl.8 Crit+Hit Gem, Ruby Dragonsoul Pack, Ruby Herosoul, Spring of Wisdom, Blessed Stone, Elemental scroll, Angel Tears and many more! More exciting events are coming up through Jan 9 to Jan 12 (Server Time), check them out in the in-game Hot Events menu now!